Netmums is a family of local sites that cover the UK, each site offering information to parents on everything from where to find playgroups and how to eat healthily to where to meet other parents. 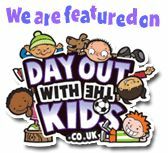 Day Out with the Kids is aimed at making life easier for parents. Assisting parents in quickly finding local venues that match the family's expectations. There are many great websites with information about outdoor activities for children, families and schools. Note: Woodland Adventurers is not responsible for the content of external sites.